Rose water is a natural eye brightening agent. It deeply cleans your eyes and and make them more brighter. Before sleeping 1-2 drops of pure rose water will bring a natural glow in your eyes. Water is a best cleansing agent. Washing your eyes with cold water keep them, cool, fresh and healthy. Whenever you get some free time don't forget to splash your eyes with cold water. Cold teabags when apply on the eyes reduce dark circles and keep the under eyes skin fresh and prevent from eyes puffiness.Take 2 used teabags and place them in refrigerator. When they become cool, put them on your eyes for 15-20 minutes. Cucumber Slices have been shown excellent results for removing eyes dark circles. Cucumber slices not only remove eyes dark circles but also prevent from dryness of under eyes skin. Everyday put two fresh Cucumber slices on your closed eyes for 15-20 minutes. After this remove Cucumber Slices and and wash your eyes with cold water.While applying Cucumber slices be careful about Cucumber Water and don't let it go into your Eyes. 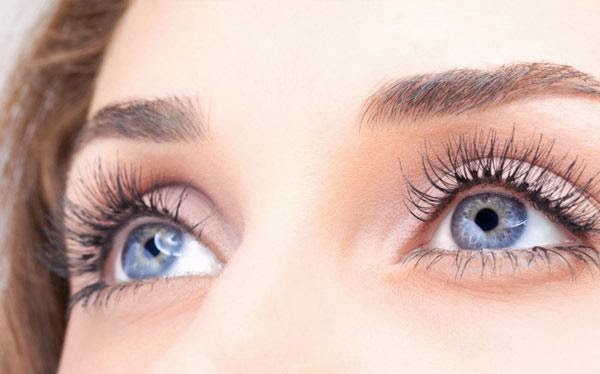 A diet rich in Vitamin A, Vitamin, C and Vitamin E also helps a lot to enhance eyes brightness. Try to eat fresh green vegetables, fruits(apples, apricots, bananas, figs, grapes, guavas, mangoes, oranges, plum, strawberries and watermelon), nuts(almonds without skin) eggs and dairy products (milk, cheese, butter, yogurt) in your diet plan. Carrots contain beta-carotene, a substance that the body converts to vitamin A, an important nutrient for eye health. Drink a glass of carrot juice on daily basis because it also helps a lot to increase eye brightness. While working on computer screens don't forget to blink your eyes after every 10-15 seconds. Blinking provides moisture to the eye by irrigation using tears and a lubricant the eyes secrete. The eyelid provides suction across the eye from the tear duct to the entire eyeball and prevent it from drying. Dip 2 cotton balls in cold milk and place them on your closed eyes for 10-15 minutes. Milk is a natural skin cleansing agent. Therefore, not only cleanse the skin around eyes but also prevents from eyes dark circles. Try to wear sun glasses before going out and protect your eyes from harmful UV Sun rays, dust and pollution. Don't forget to use a pair of goggles while swimming to protect the eyes from chlorine as it can dry the eyes and cause a burning sensation. Working till late night and lack of sleep can cause weakness of eye muscles and results in tired, puffy and unhealthy eyes. Proper sleep of at least 7-8 hours is also essential to get bright, glowing and healthy eyes.